How does my personal identity compare to my organisation’s identity? How do we select the right people to help us bring the organisation to where we want to be in the future? How can we get everybody aligned with our corporate or team-strategy? How can I communicate my strategic plans in a way that people will feel motivated to work with me on it? Do these questions sound familiar? Have you ever thought that, even though you might be convinced your strategy is a good one, you have a hard time explaining it to others? Do you recognise it that people often use the same old ‘buzzwords’ to explain their strategy? And that these ‘soundbites’ are pretty much what for all companies strive for? I agree that a strategy, and communication around it should generic enough to make it possible for everybody in the organisation to feel part of it. But at the same time, it should specific enough to motivate individual employees to feel part of it. So how can we craft a motivating strategy, and how can we communicate it? To start answering that question, first of all we have to ask ourselves: “what is strategy?“. In my post “What does strategic doubting look like?“, I described it as: “the plan, the organisation has to reach its vision, and the methods it is deploying to implement those plans”. I also gave my definition of mission (“the company’s purpose and plans/choices to pursue that purpose”), vision (“what the company will look like in the future if it continues to pursue its purpose”) and values (a set of why’s that all stakeholders of the organisation share and use when making choices). In my opinion, when most people talk about strategy, they don’t talk about its relevance, but rather about how to implement it. Does ‘aligning’ and ‘cascading down’ sound familiar? In my opinion, both (and probably more) should be in the mix. In a couple of posts to come -starting with this one-, I will try to explain my take on this. For me to embrace my company’s strategy, I have to see the relevance of it for myself. I can only relate to it if I can see the value of it for me personally, now and in the future. The image above describes (part of) how I would like to see my company’s strategy presented. In one picture, I should be able to see how my ‘personal identity’ compares to ‘my organisation’s identity’. And I should be able to see if we have a future together. 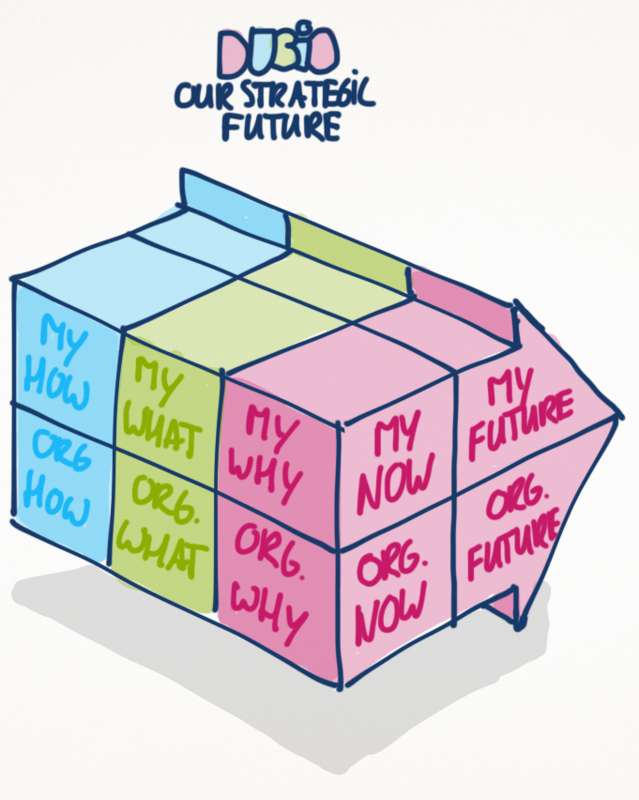 Maybe not the most dificult part of the picture is to describe strategy as a shared direction (I share ‘my what’ with ‘my organisation’s what’, the green part of the arrow). If I can see what choices Our strategic futuremy organisation is making, I can see if there is a match with the choices I am making. And, better yet, I can choose to adapt my choices to those of my organisation. In order to do that, I have to be able to specify the overall strategy of my organisation to my specific situation. Which of my organisation’s choices affect me? To which choices can I contribute? No rocketscience so far, right? Slightly less obvious however, is to describe strategy as a set of core capabilities (My ‘organisation’s how’ and how ‘my how’ can contribute to that, the blue part of the arrow). If I would know what my organisation considers it’s core capabilities, what my organisation is really good at, I probably would feel a little proud to be part of that. If I would know how my team’s capabilities, together with othet teams’ capabilies add up to a picture of what we are good at as an organisation, I think it would motivate me. If I’m motivated by what I’m good at (See ‘mastery’ in post “Why do I do it? – Motivation“), I think I would be motivated by knowing what we are good at collectively. Maybe a stretch, but still interesting I think. Most powerful for me personally is to describe strategy as a set of shared beliefs (‘My why’ is ‘my organisation’s why’). Knowing what my organisation beliefs in gives me the opportunity to consider if I belief the same. Knowing what my organisation considers its ‘dot on the horizon’, and what beliefs and values are guiding it in its choices, help me evaluate the relevance my own choices and actions. Why am I doing what I do? Q: Do you agree with my reasoning? Do you agree that communication around strategy is often focused on strategy as a shared direction?